Chicago, IL - The Reverend Father Damjan S. Bozic, Cathedral Deacon at Holy Resurrection Serbian Orthodox Cathedral in Chicago, was awarded a Doctor of Ministry Degree on Saturday, May 7th, 2011, at the University of St.Mary of the Lake - Mundelein Seminary following the successful completion of his doctoral studies and acceptance of his dissertationThe doctorate was conferred by His Eminence Francis Cardinal George of the Roman Catholic Archdiocese of Chicago. Under the mentorship of the Very Reverend Fathers Raymond Webb and Thomas Baima, the theme of Fr. Dr. Damjan Bozic's dissertation was "Ecumenical Awareness: An Introduction for Students of Orthodox Theology." The purpose of this academic study was to produce a manuscript that students of Orthodox Christian theology, who often originate from areas where there is a lack of exposure to a plurality of religious communities, may apply in order to understand other traditions thereby becoming more effective preachers and ministers of the True Faith and practice of the Holy Orthodox Church. 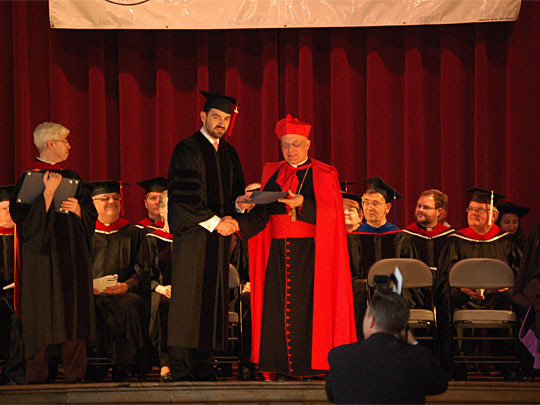 The conferment of the Doctorate of Ministry to Deacon Damjan S. Bozic also marked the first award of a post-graduate degree at the University of St. Mary of the Lake - Mundelein Seminary to a non-Roman Catholic. The Reverend Deacon Dr. Damjan S. Bozic began his doctoral studies at the University of St. Mary of the Lake - Mundelein Seminary in 2008, with the blessings and encouragement of the late Metropolitan + Christopher of blessed memory.